anglers, and often go to great lengths to ensure that fish are not harmed during the entire angling process. These days this philosophy is becoming just as prevalent among bassmen, as anglers land lunkers, measure the trophy, snap a pic, and tenderly return the fish to water. 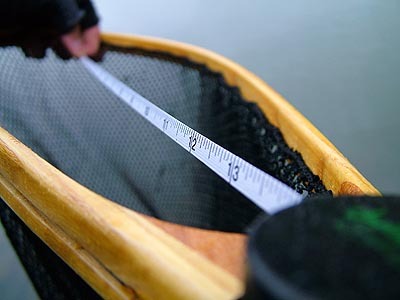 Angling Design�s Handi-Measure is a unique tool that allows anglers to make the entire measuring process simple for both themselves and fish. Impressions: The Handi-Measure is essentially a compact weatherproof tape measure that can be easily mounted to just about any net. This simple idea is well carried out with the Handi-Measure's unpretentious dependable design. When I first received the Handi-Measure the unit was a little smaller than I thought it would be and I immediately liked the way in which the unit was designed to mount on the handle. No metal to rust on this unit, and Velcro straps allow the Handi-Measure to fasten on just about any net, without any harm to your net's handle. Real World Test: Before going out on the water we actually stress tested the recoil mechanism on the tape measure by pulling vigorously on the tape. After a great many pulls we were convinced that the Handi-Measure was indeed durable enough for outdoor use, and could easily deal with violent repetitive pulls. We then field tested the Handi-Measure in two very different applications. First we employed the Handi-Measure while fly fishing for trout, then we used the Handi-Measure to appraise the length of some largemouth bass while fishing from our bass boat. Installation: The Handi-Measure is fastened to your net with the attached adjustable Velcro ties. 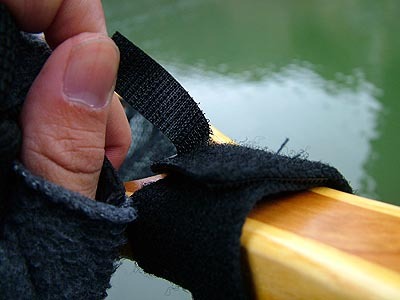 The Velcro fastenings attach at two points, around your net�s neck and through the junction of the opening. This forms a secure three point fastening, and prevents the Handi-Measure from rotating during the measuring process. Installation takes mere seconds, and throughout our tests we didn�t have to re-adjust or tighten the Velcro fastenings at all, the measure holds securely during gear transport and while fishing. Handi-Measure in action: While fly fishing for trout we performed the entire landing procedure exactly like we would normally do once hooked up, then once it came time to measure the fish we found that we no longer needed to reach inside our vests and pull out a tape measure since the Handi-Measure was now conveniently mounted on our net. We lifted the net to the surface and kept the fish as submerged as possible then reached underneath the net to support the fish and before we knew what happened the fish had flopped out of the net and was gone! What had gone wrong? What essentially happened was we had not properly waited until the fish had settled down, and had brought the fish to measuring position prematurely while the net was not directly under the fish. It is absolutely important to wait until your fish is ready to be measured. From that point on we knew better, and took our time to ensure the fish was calm and ready before attempting to line the fish up to the net. Cradling the fish in the center will allow the buoyancy to actually help straighten out the fish naturally. By our third fish we had the entire process down. When done correctly the fish will not flip out of your net, and instead simply fall back into the net if active. Take your time and you and the fish will both be better off. You can even caress the fish with your hand underneath the net, which is much better than lifting a fish outside of the water since your hand is always wet when reaching below the net. 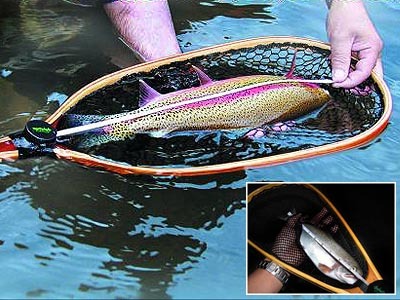 Larger trout that don't fit in the net can still be measured by just extending the tail outside the net, the tape can measure any fish up to 36 inches in length. With a little practice the entire procedure became effortless. Unlike fly fisherman bass anglers are accustomed to horsing bass up and out of the water. While bass certainly are more robust in nature than trout, it is still a good idea to get these fish back into the water as fast as possible if you intend to practice CPR (catch-picture-release). 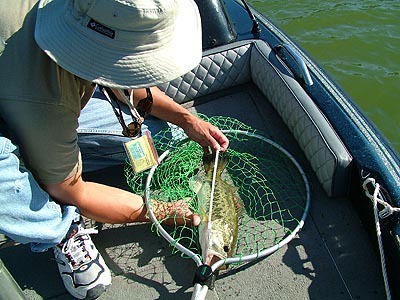 We found the Handi-Measure just as easy to mount on our economical aluminum net, and it was easy to utilize the same techniques to measure bass in the water, or quickly on the deck of the boat. Applications: The Handi-Measure won�t necessarily help you catch more fish but it is designed to improve the total fishing experience for both you and your catch. 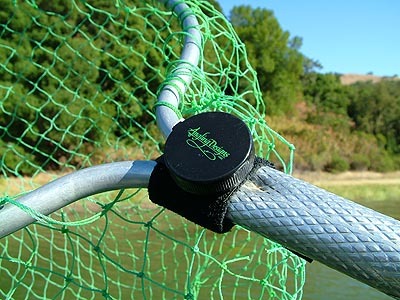 Angling Designs does have another product that will actually help you catch more fish, called the �Quick-Seine.� The Quick Seine mounts on your net the same way that the Handi-Measure does, but instead of releasing a tape measure it holds a white seine net that extends around the entire opening of your net. By dipping the patented Quick-Seine into the river and shuffling a few rocks in front of the net you immediately will discover the prevailing insects that are in the water at the time. This helps anglers "match the hatch," and anglers gain an immediate advantage by taking the guesswork out of what patterns and sizes to pick. The Quick-Seine is another good example of the forward thinking that Angling Design's products illustrate. What we liked best about this companion product was that it easily mounted on the other side of the net without interfering with the Handi-Measure. These two products effectively turn your landing net into 3 tools in one. Conclusion: The main advantage of the Handi-Measure is the ability to organize and access the measure instantly, without having to juggle your fish around needlessly. No more fumbling for your tape measure while standing in the middle of a river. This results in more time for you to focus on doing what you are there to do, catch fish. But perhaps the biggest benefactors of the Handi-Measure are the fish, due to the reduction of contact with the angler fish are less stressed and have a much better chance of returning to the stream in prime condition. The Handi-Measure and Quick-Seine are patented or patent pending products, and Angling Designs has done a first class job creating simple easy to use tools that will help improve both you and your catch's encounter while on the river.